One of today's most accomplished chant scholars presents The Collegeville Chant Psalter, a new responsorial psalm collection for Catholic worship. Fr. Anthony Ruff's compositions faithfully follow the U.S. Lectionary text of the psalms and responses for the complete three-year cycle of Sundays and major feast days. The collection also includes settings of the "Common Texts" responsorial psalms. The music, accompanied or unaccompanied, is accessible and singable with chant-based responses for the assembly, new and engaging tones for the cantor, and stylistically-appropriate and beautifully-simple accompaniments for either organ or keyboard. An important new resource, The Collegeville Chant Psalter answers the church's call to give chant more "pride of place" (Sacrosanctum concilium 116) in the liturgy, serving well as either a stand-alone parish psalter or as a supplement to other psalters. 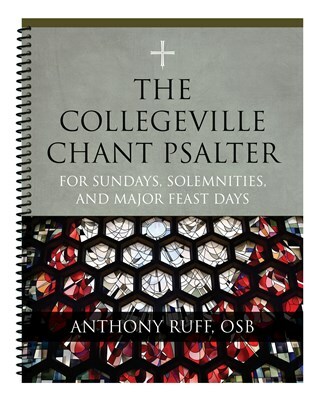 Those who purchase The Collegeville Chant Psalter may also be interested in Anthony Ruff's earlier publication, Responsorial Psalms for Weekday Mass: Advent, Christmas, Lent, and Easter. Fr. Anthony Ruff, OSB, is a monk of St. John's Abbey. He teaches liturgy, liturgical music, and Gregorian chant at St. John's University School of Theology-Seminary. He is the founder of the National Catholic Youth choir. He is widely published and frequently presents across the country on liturgy and music. He is the author of Sacred Music and Liturgical Reform: Treasures and Transformations, and Responsorial Psalms for Weekday Mass: Advent, Christmas, Lent, Easter.